We’re back from our family visit to England. We had a great time with my brothers and their families. It would be wonderful to do it more often. It was an interesting time to be there. Just over a week after we arrived, the Daily Mail newspaper carried the banner headline: “Another day, yet another terror attack.” A number of attacks on French and German targets took place while we were on the other side of the Atlantic. An attack on foreign tourists in London on Wednesday evening resulted in the death of a 64-year-old American lady. As with some of the incidents in France and Germany, terrorism was not blamed. Rather, the perpetrator, a Norwegian of Somali ancestry, had some “mental issues.” The majority of British people do not accept this, pointing out that the attacker is a Muslim. It turns out that he has “recommended jihad terror books,” according to one source quoted on the Fox News website this afternoon. Governments have no idea what to do. At the same time, the media does not understand what is happening – every tragic event is either excused or seen through the prism of political correctness. There remains no comprehension that the West is under attack from Islam, as it has been a number of times in history. The goal is the conquest of the West – the security situation can only get worse. Speaking on Thursday July 28th, Germany’s Chancellor, Angela Merkel, clearly does not see any connection between her open door policy toward refugees and the recent terror attacks, at least two of which were perpetrated by new arrivals into the country. Such blindness defies all logic. It’s the same in France. And in the United States, for that matter, where the Obama Administration has repeated its plan to allow 10,000 Syrian refugees into the country, in spite of fears of terrorism. Perhaps the president is trying to atone for letting Syria down in the first place! ISIS has been behind 141 terror attacks in the last 30 days, yet the President and Secretary of State say we have them on the run. In addition, there have been other non-ISIS attacks, like the young man in Munich who killed 9 people, including seven teenagers, at a MacDonald’s in a Mall in the German city. He was German born but of Iranian descent. A shi’ite Muslim, he’s not likely to have been influenced by ISIS, but he was still a Muslim. It has become apparent that French security services are lacking when it comes to preventing attacks. How could a large truck enter a vacation area in Nice and mow down 84 people, including ten children? A few well-placed concrete blocks would have prevented the attack. Apparently, there are six security agencies operating in France and they don’t tend to co-operate. The country urgently needs an MI6 or a Department of Homeland Security, to bring all the agencies under one security umbrella. So now all four major western powers have been attacked – the US, UK, France and Germany. The last two have elections next year. Fear of further attacks could bring more right-wing parties to power. In turn, this could lead to a change of policy. Instead of allowing in unlimited numbers of migrants, some of whom are inclined toward terrorism, borders may close and countries start hitting back. Professor Samuel Huntington predicted over twenty years ago a “coming clash of civilizations” between Islam and the post-Christian West. This is what we see developing now. The biblical book of Daniel prophesied the same development 2,500 years ago. In chapter 11 we read of the King of the North and the King of the South. These were two dynasties that succeeded Alexander the Great in the fourth century BC. These two powers frequently warred against each other. Each time they did so, the Jews were caught in the middle. An attack on July 25th was of particular interest. It was the first time the Church was attacked. 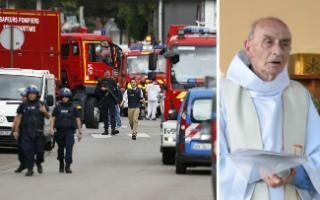 An elderly Catholic priest in a village near Rouen had his throat slit while officiating at mass. His two killers got up and preached a sermon in Arabic. They were later shot by the police. These two “religions of peace” have warred against each other on and off throughout history. In 1095, also in northern France, Pope Urban II called on European leaders to launch “a crusade” against Islam, in defense of Christians in the Holy Land. The Crusades lasted two centuries. Their legacy remains with us to this day. Further conflict came in the 16th and 17th centuries. Renewed conflict between the two religions could erupt again if Islamists keep provoking the Church. It’s not just the “United States of Amnesia” that needs some historical advisors. Every government in western Europe, every president and prime minister and even the pope could all do with some history lessons. They need to see Islam in its historical setting to learn that the religion is expansionist – imperialist, in fact, and that the West is now at war with Islam, even though few seem to realize it.